I went to the Cafe Brauer May Patio Preview as a Time Out Tastemaker and was pleasantly surprised at the versatility of this widely-known location in the heart of Chicago. Cafe Brauer offers beautiful sights of the skyline, a waterfront patio, and shaded seating for scorching summer days at the zoo. Drink highlights included a complex watermelon Paloma, bitter blood orange margarita, and smooth cucumber martini. Though the staff is incredibly hospitable with it's open kitchen and quick service, the prices seem slightly high- the impossible burger and fries (a vegan alternative to the typical burger) runs $19. Beside the prices, which one might excuse because the park itself is free, Cafe Brauer is a family-friendly, healthy, and more sophisticated alternative to the classic popcorn and cotton candy carts seen in the area. I went to the Patio Preview event at Cafe Brauer's patio yesterday, May 10, which was my first introduction to Cafe Brauer, although I'm certainly familiar. 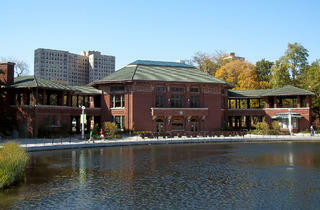 Set on a small pond at the entrance to Lincoln Park Zoo (with the Chicago skyline as a backdrop), this establishment is pretty much a Chicago institution and an iconic spot for weddings and celebrations. The building is over 100 years old, and it feels that way--there's nothing new or hip about this spot, if that's what you're into. But it delivers a charming setting for a romantic date night or a place to take out-of-towners for the first time (paired with a visit to the zoo). The margaritas -- a blood orange and a spicy jalapeno -- were nice and easy to drink, and they were especially enjoyable because they were served by such a charismatic, friendly bartender. The entire staff seemed quite friendly and eager to please at the event, in fact. The food was solid bar fare, including a buttermilk fried chicken breast sandwich, an Impossible Burger, and a patio pub burger, alongside a Greek and Caesar salad. The dessert was an easy crowd-pleaser -- a nutella panini with strawberries, powdered sugar, and whipped cream (although I'm still partial to the classic crepe, myself). The food items were, all in all, well-executed American standards. Beautiful setting, good food and drink, live music. Perfect! 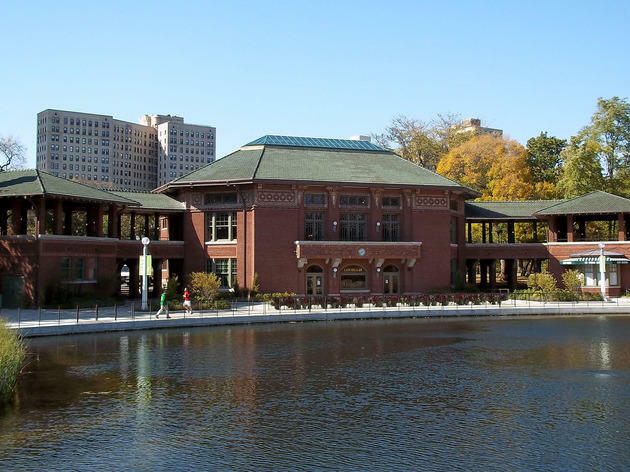 After a lovely day shopping at the Green City Market, and then staring at the gorillas in the Lincoln Park Zoo, stop by Cafe Brauer Patio for a watermelon margarita and an eggplant entree, all of which used ingredients from the Green City Farmer's Market. You are there for a refreshing beverage, and a snack, but it's really not about the food here, its about the KILLER VIEW. It's hard to get such a perfect spot for people watching as you see families and couples stroll by to or from the zoo, and for one of the best views of the city skyline along a garden horizon. The calamari was lovely, the bloody mary was solid, and the watermelon margarita was perfect for a summer day. I will definitely be bringing my mom here for a ladies afternoon drink, or my girlfriends for a walk and drinks outing! The patio at Cafe brauer is a perfect outdoor brunch/lunch/dinner place in the warm months of Chicago. As you drink and eat, you can easily view the skyline over the pond. Cafe brauer is dog friendly so bring your pup along too! All of the menus contain a bit of variety so everyone should be able to find something they like. The bloody marys are excellent and could be enjoyed all day. You can't go wrong with a patio or turkey burger. Both come with homemade chips or for a bit more you can pick a different side. If the wait is long for a table, pop over to the zoo while you wait. The Patio at Cafe brauer is a must if you're in Lincoln Park.